Unlike its sibling the Tudor Heritage Black Bay Bronze Blue for Bucherer or the brown model, the new Black Bay Bronze Slate Grey ref. M79250BA-0001 sports a gorgeous grey dial that is gradated from the periphery to the center. The matte grey dial on the new Tudor Black Bay Bronze features applied Arabic numerals at 9, 6 and 3 o'clock, gilt transfers, ecru luminescent material and a snowflake hour hand. Thanks to its slightly domed sapphire crystal, the watch has a relatively vintage look and feel. The new Tudor Black Bay Bronze Slate Grey comes equipped with the same Bronze/Aluminum alloy case measuring 43 mm as its brown dial and blue siblings. Regardless of the larger case diameter when compared to the Heritage Black Bay in stainless steel, the Bronze version doesn't wear that much bigger, to be quite frank. Even though the bronze alloy utilized by Tudor warrants a more uniform 'patina' that builds over a longer period of time than that of other bronze watches in the market, upon wearing the watch for the very first day, we were able to see that gorgeous darker color starting to appear on the case band and crown. After a full week of wear and even though we have already even swam with it, the case has not changed much more and barely any additional patina has appeared —a huge downside in our opinion. We'll just have to wait and see how it evolves. Equipped with a screw-down crown signed with the iconic Tudor rose logo, the Tudor Black Bay Slate Grey doesn't have a crown tube in contrasting color like all the other Black Bay watches in stainless steel. Without a doubt, something we absolutely prefer. Just like the regular production Tudor Heritage Black Bay Bronze, the Tudor Black Bay Bronze Slate Grey features a bezel setup in bronze with blue aluminum insert. The blue bezel insert features gold colored graduation and a luminescent pearl insert at 12 o'clock. The Tudor Black Bay Bronze Slate Grey comes with two straps: a distressed black nubuck leather strap and a black fabric strap with beige colored stripe that gets its inspiration from the fabric on the straps of the parachutes of the French Marine National. A great plus is that both straps are already fitted with their respective bronze pin buckles. This Tudor Black Bay Bronze Slate Grey is powered by the newly released automatic Tudor in-house calibre MT5601. This movement released in 2015 provides a power reserve of 70 hours and is COSC certified. The movement is protected by a solid case back in brownish PVD stainless steel matching as close as possible the hue of the bronze case. 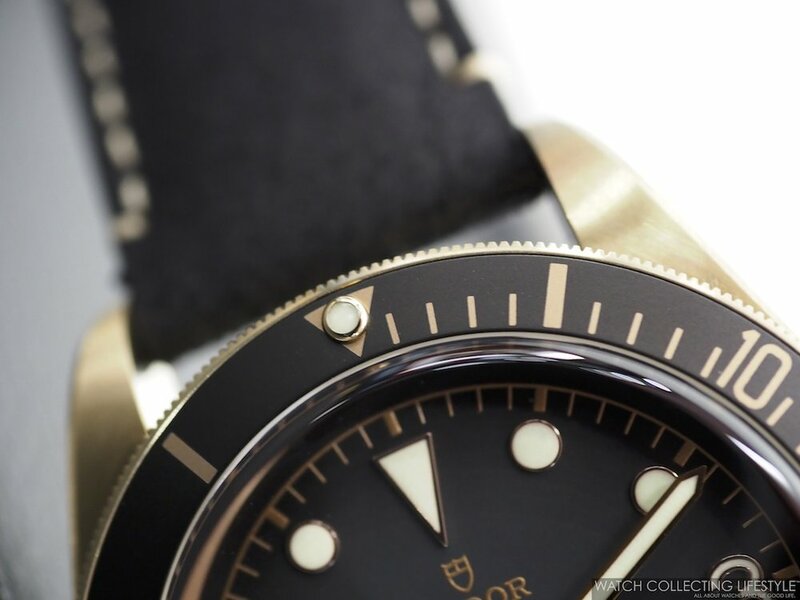 On the wrist, the Tudor Black Bay Bronze Slate Grey ref. M79250BA-0001 wears slightly smaller than its actual size and not that far off from a 41 mm Tudor Black Bay in stainless steel. The watch looks very rugged on the distressed leather strap and its wrist presence is simply fantastic. For sure the type of watch that patina will make better as you collect memories with it. We really can't wait for that crazy patina to start to appear and transform this watch into a living organism that changes day after day. Sticker Price $4,050 USD. For more info on Tudor click here.